Toronto Comicon marks the end of Crozonia Year 1, where I debuted the first full colour issue. Hope this sales data is usefull for other publishers. It's certainly been usefull for me. Hopefuly this bodes well in Chicago. Two Movies, and a Convention. This weekend, Silent Hill premieres. Look for the grey child transformation. I worked on that shot. Then there's the second weekend of The Wild. And on Sunday, there's the Toronto Comicon where I will be exhibiting Crozonia. Sales data to come. 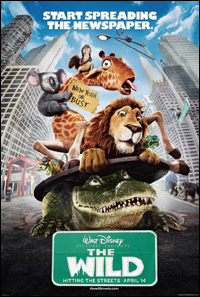 Disney's The Wild in theatres now! This is the movie that I worked on for two and a half years! It is the largest animated production in Canadian history! Please check it out!